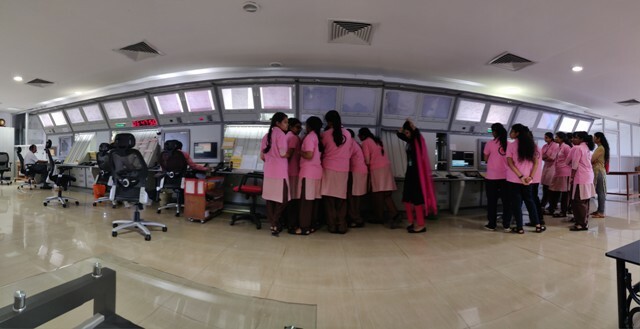 Mangalore International Airport (MIA) under the guidance of Airport Authority of India (AAI) organized a session at the MIA Conference Hall for the girls of class 11 and 12 of various colleges in Mangalore. The main aim of this session was to educate us on the various career opportunities in the aviation industry. This was organized in connection with Girls in Aviation Day which was celebrated on 23 August 2018. Ms Kamal Chakaravarti, Chief Financial officer of Bird Group was the chief guest for the day. She briefed us about the various career opportunities in the aviation field. There is a misconception that aviation field is only limited to men, and girls are only serving in the cabin crew that is air hostess. This informative session enriched our knowledge and made us aware of the technical aspect and the working of the airport. We were taken on a tour around the airport and also to the Aerodrome Traffic Control (ATC) Tower and were briefed about the various functions of the ATC. We were lucky enough to witness this as it is a restricted zone for the citizens. We were taken to the AOCC (Airport Operations Control Centre) and were also told about the tracking arrival and departure. We learned more about the working of ground staff, cargo and administrative department of the airport. The need for Air doctors, lawyers and also other professional courses is very high in the aviation industry. After the tour and briefing about the various technicalities and different sections in the airport, we were taken back to the conference room where we were served lunch and then the session was concluded with students representatives expressing their opinions about the session.